In the battle for high rankings in the search engines, link building is a popular technique. It can, however, take a lot of work, so you might be tempted to go for the quick solution and want to buy some links. 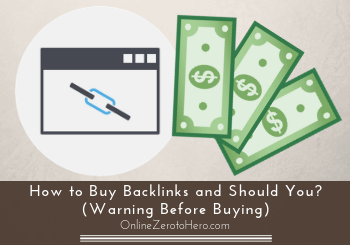 In this article, I will show you how to buy backlinks, but most importantly I will also give you some perspective and warnings you HAVE to consider before doing this. If you rush into buying links, you can end up causing yourself a lot of problems in the long run, and it might also not be necessary to do this to get good rankings. Will link building help you? I think there can be no doubt that having some high-quality backlinks to your website can help you. This is not only from learning from SEOs that do this, but you can also figure out that it can help by using logic. If you get a link to your site from an authoritative website with a lot of traffic, it will naturally lead to more traffic. More traffic and more exposure can lead to more links, more rankings, and even more traffic. So no doubt that getting the right links can be valuable. I however just want to make a side note and say that you do NOT necessarily have to do link building to get good rankings – I know this is controversial to say in the SEO world. But I have achieved great results without using link building. Below you can see the traffic for one of my websites in a quite competitive niche and the results achieved without doing ANY link building. Example of organic traffic I achieved without link building. This result was achieved by learning and applying proper SEO. It is possible that I could have achieved faster and even better results by doing link building, but that is not my point here. I just wanted to give some perspective to the link building discussion. Yes, quality link building can definitely help your website, BUT if you do not know how to do it properly, it is possible to get good results also without it. So now we have established that getting links can help your website. But what about bought links? Can these help your website as well? Can it help to buy SEO backlinks? I have actually not tried to buy backlinks myself – I have not done this for several reasons, and after reading this article you will understand why. It is not because it cannot help your website – because from the evidence I have seen, it definitely can. I have seen websites getting really good rankings by obviously buying backlinks. However, I have also seen numerous examples of people suddenly losing more or less all their traffic overnight because they were penalized by Google. So it can have positive effects, and you will see many people being willing to show you how to do this. Below I will show you some of the places where you can buy backlinks. Be aware that most of these places will not tell you about the risks of buying links. So be sure to also read the warning later in this article, so you can calculate if it will be worth the risk for you. Where can you buy backlinks? There are a lot of freelance portals where you can get help to all kinds of jobs. Here you can also find people that will do link building for you. You can get a lot of links here very cheaply. See for example what you can get on fiverr on the image below. 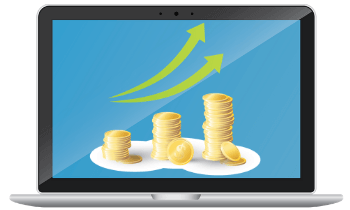 You can buy very cheap backlinks – you should however be careful about this. 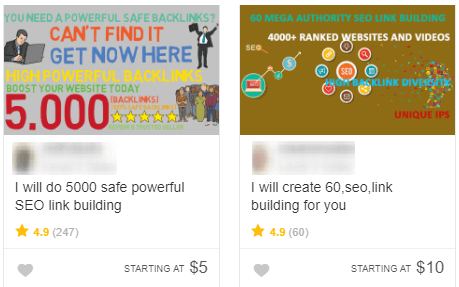 On this image you can for example see you can get 60 links for $10 and someone is even offering to build 5000 links for $5. This might sound tempting, and it is definitely cheap backlinks. But be VERY careful about buying links like this. You can be pretty sure that it will not be high-quality links for that price. If you do decide to buy links, you should at least be more careful and not go for offers like these. Many big marketing agencies actually offer to help you buy backlinks. I know, as I have worked as a freelancer for several big agencies, and it is common practice for many of them to offer this service. This will in most cases be quite expensive, but they often have good connections with big websites, so they are making sure the quality will be high. Again, it will in my opinion still have some risks, as I will get into later. If you talk to the agencies themselves, they will probably claim it does not have any risks, as they are doing it safely, but the truth is that nobody really knows when Google will still be able to detect it and see it as an attempt of manipulation. So do not believe their guarantees, but consider the pros and cons for yourself, and then decide if it is for you or not. Many websites offer you to buy links directly on their site. You can reach out to specific websites you would like a link from and ask them. Sometimes they even have a tab in the menu about services, where they describe this. In many cases, you do not even have to do much to find opportunities to buy links. I had not had Online ZeroToHero.com for long before I started receiving emails from people that offered me to pay to get links on their site. Often people will also contact you to offer you to pay for backlinks. The email above shows one of the emails I received. 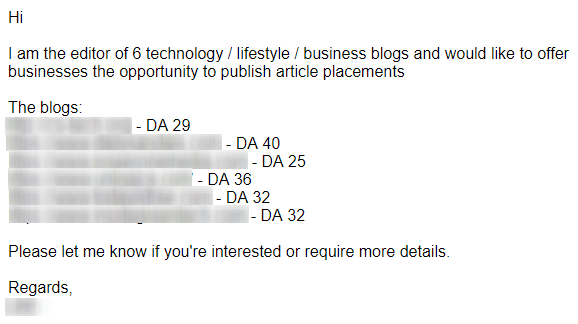 It does not directly say that I can buy links, but when it mentions it offers article placements and mentions the domain authority (DA) of each site, it is pretty clear this is what it offers. So in many cases, people will even start approaching you to sell links. It can sometimes help your website to buy links to it, and it is also easy to find places where you can buy the links. The questions is then if you should buy backlinks. Buying and selling links are a very common practice, but it actually goes directly against Google’s guidelines. It clearly goes against Google’s guidelines to buy or sell links to boost rankings. The image above is a snippet from Google’s guidelines for link schemes. It clearly says that buying or selling links can negatively impact you rankings. This does not mean it always will. I have seen websites that clearly buy and sell links, and they still have great rankings. The question is then if and when Google will find out. Personally, I work with white hat SEO and try to stick to Google’s guidelines, but that is often a matter of how much you are willing to risk. I think that buying links is kind of unethical, and I am personally glad Google is trying to figure out which sites are doing this. When we search on Google, we all want the best results that answers our questions. We should think about this when creating our own content as well. Does it really deserve to be at the top of Google? I have worked with clients that had very poor sites with very little content. They did not care about providing quality info – they just wanted high rankings. This can potentially be achieved by buying links, but would it not be terrible if we only were able to find the results on Google that had the biggest budgets? It would be bad for all of us, and that is also why I personally do not want to participate in buying or selling links. Every time there is a big Google update there are sites that lose most of their traffic more or less overnight. You can also get a manual penalty from Google, if they find out you are not following their guidelines. In fact, people can even report it to Google, if they believe you are buying or selling links. Below you can see an image from one of my fellow online entrepreneurs on the platform Wealthy Affiliate, who back in 2013 got penalized for buying links. 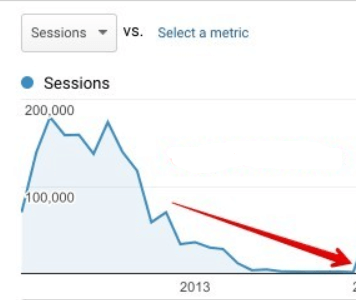 An example of website traffic after a Google penalty. If you get penalized like this, it can severely hurt your website and income, and one way that can definitely get you penalized is to buy links, as it clearly goes against Google’s guidelines. That you do not buy links will of course not guarantee that you will not get penalized. And buying links does also not guarantee you will get penalized. But it is important to know this risk, so you know the potential pros and cons before buying any links. I have not written this article to say you should or should not buy backlinks. It depends a lot on personal preferences and how willing you are to risk getting penalized for faster results. Personally, I would however never buy or sell links. Overall you should also be aware that when it comes to SEO there is NO fast shortcut – if there is, you have to calculate into it that it will likely lead to a penalty at some point. No matter what, it is first of all important to focus on creating amazing content and then to do proper SEO. This is the foundation of your website. Without this it will be difficult to get good rankings, to get high quality backlinks, and it will be very easy for Google to figure out, if you are buying links and trying to manipulate the algorithm, if you have a poor website with a lot of links. But ultimately it is up to you which approach you are going to take – you just need to be aware of the pros and cons of different approaches, and then make the choice that works best for you. If you have any comments, questions, or have any experiences with buying backlinks yourself, I would love to hear from you in a comment below.